USB Converter - Custom Sensors, Inc. 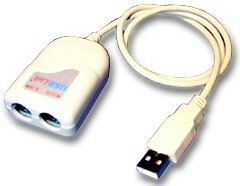 The MT606-1 is a USB to PS/2 converter. It can be used with a PS/2 Keyboard and Mouse in addition to barcode scanners with PS/2 interfaces. The MT606-1 has one PS/2 keyboard port and one PS/2 Mouse port. The MT606 converter will enable keyboards, pointing devices (mouse, trackball), and conventional barcode scanners with keyboard wedge interfaces, to be used with computers that feature Universal Serial BUS. At present, newer PCs with the Windows® 98, ME, XP and Windows 2000 operating systems, feature USB Ports. The Model MT606-1 can accept inputs from a PS/2 Pointing Device and a PS/2 Keyboard or Barcode Scanner..
Dimensions:             2.2" X 1.5" X 0.85"